It is perfectly reasonable to expect any large European city to change over the course of four-hundred years. Yet, in the case of Naples, many of the physical features of the city from 1600, and even well before that date, are still easily discernible in the layout of the modern city: the Angevin fortress at the port is still prominent; the large St. Elmo castle and adjacent museum of San Martino (an ex-monastery) still dominate the heights of the city; the famed —notorious!— Piazza Mercato with its Carmine church is still there; the square blocks of the Spanish Quarter are still easy to identify; etc. etc. One part of the city, however, that has changed beyond all recognition is the section of Naples known as Poggioreale. 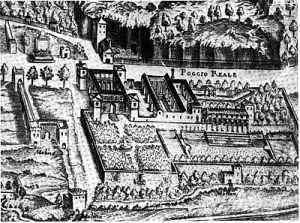 If you go to the spot where historical maps tell us that one of the great examples of Italian Renaissance architecture once stood, the Villa Poggioreale, you would never know it. It has absolutely disappeared. Strange—that name. “Poggioreale” means “royal hill”—clearly, a fine hill at the foot of which one might build a residence fit for a king. The only well-known such seats of royalty in Naples are the above-mentioned Angevin fortress from 1300 and the various Bourbon royal palaces from the 1700s, notably the Royal Palace in the heart of the city and the building that is now a major art museum on the Capodimonte hill. The name “Poggioreale” now means other things to modern Neapolitans; it the site of the largest cemetery in the city and the site of the largest prison in southern Italy; the main train station is there; it is, broadly speaking, the grimy and degraded industrial section of Naples (thoroughly bombed in WW2); optimistically, however, it is also the location of the gleaming new Centro Direzionale, the new Civic Center, an island of glass and steel skyscrapers (perhaps as close to Regained as this former paradise will ever get). Was there, then, ever a true royal residence in that area? The economic doldrums of the late 1600s and the turbulent change of dynasty in 1700 did not encourage expansion, or even maintenance, of the city and its environs. That condition did not change noticeably until the arrival of the Bourbons in the 1730s. Their priorities, like those of the Spanish, did not involve keeping up the Villa Poggioreale; they chose, instead, to build to the east, yes, but along the coast, where there arose a string of spectacular homes for the noble classes, residences that are now historically known as the “Vesuvian villas.” Farther inland, the area at the foot of that “royal hill”, the site of the Villa Poggioreale, was left to its own devices. (It was no longer a royal residence since the Spanish and then the Bourbons had built their own such estates either inside the city or, if outside, in other directions (for example, the Bourbon Palazzo Reale at Portici on the coast, in the shadow of Vesuvius). The “decline” of the area (though not viewed as such at the time), started with the decision in 1762 to locate the new Santa Maria del Pianto cemetery in the area. For its time, it was a very forward-looking, new and hygienic approach to cemetery management in Europe, one that forbade burial within city limits, moving that activity out of the city to one large single location. That site was greatly expanded in the 1830s with the addition of the adjacent Cimitero Monumentale. It is all now known simply as the Poggioreale Cemetery and is the largest cemetery complex in southern Italy. As modern as all that was, such a move obviously discouraged further residential building in the area, or even maintenance of those properties that were now in a setting swiftly becoming less and less idyllic. Subsequent location of early industry in the east did not help, either. Maps of the mid-1800s do show the name “Poggioreale,” but show little more than tracings of where the by-then 400-year-old villa had stood. To finish off any pastoral illusions, the train station was then placed in the area when railroads came of age, and subsequent grander stations and necessary rail yards grew as the railroad industry expanded. Then, the large prison of Poggioreale was located in the area in the early 1900s, and, finally, the area was heavily bombed in WW2. So much for Italian Renaissance architecture in that area. There is now no trace of the villa at all. What was presumably the main entrance of the Villa is now directly across the street from the entrance to the cemetery. To my own disappointment, I have not been able to determine exactly what happened to the place —that is, physically. Who were the landed gentry in the late 1700s who lived there and decided to leave because the king had decided to open a cemetery across the street? What was the process by which bits and pieces of the structure and gardens started to vanish, leading to the ultimate disappearance of the whole villa? As they say, more research is needed. Stay tuned. (1) See J. Leostello da Volterra, Effemeridi delle cose fatte per il Duca di Calabria (1484-91) cited in. G. Filangieri di Satriano, Documenti per la storia, le arti, le industrie delle pronvincie napoletane, Napoli, 1883-91, vol. 5, pp. 230 and 315, vol. 6, p.45. Ackerman, J.S. (1963). “Sources of the Renaissance Villa,” in Studies in Western Art. Acts of the XXth International Congress of History of Art. Princeton. Blunt, Anthony (1975) Neapolitan Baroque & Rococo Architecture. London. Hersey, George L.H. (1969) Alfonso II and the Artistic renewal of Naples 1485-95. New Haven and London: Yale University Press. Pane, Roberto. Il Rinascimento nell'Italia Meridionale. 2 volumes, (1975 vol. I), (1977 vol II), Milan: Edizioni di Comunità.